Sainsbury’s have got my goat. Once in a while, I pop in to buy a meal deal for lunch. I have previously enjoyed the fact that I could do so; how normal it felt to be part of the hordes of office workers and simply go get a sandwich. The £3 limit made it affordable. So I was rather cross when I noticed a few weeks ago that the gluten-free options appeared to have been removed from the meal deal. This was one of the few areas in which I wasn’t paying extra for the gluten-free version. 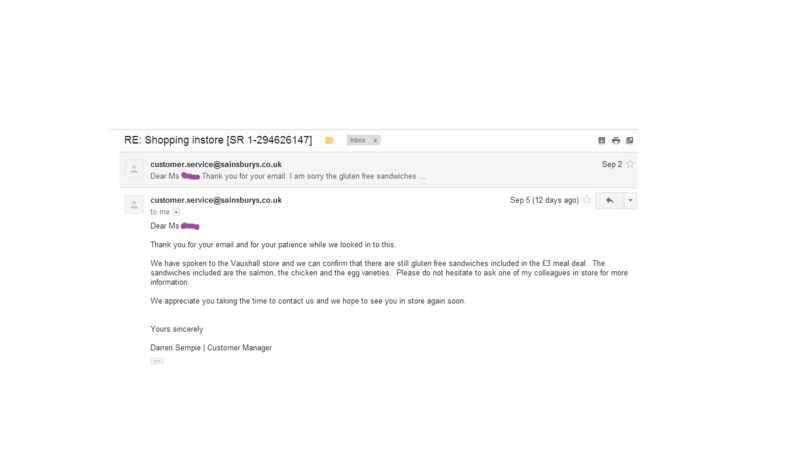 So, annoyed when I couldn’t pin down a member of staff instore, I emailed a complaint to head office. This is the reply I received. I dropped in again to check. There were two varieties of GF sandwich on the shelves, not three, and only one of them had a label. It was not labelled as being part of the meal deal, and the remaining sandwiches were shoved in a corner amongst the sandwiches for normals, making the GF options unclear. Don’t get me wrong, I am insanely grateful to even have these options (I remember when it was an impossible dream to buy gluten-free ‘on-the-go’ food), but I was annoyed and this time I queued up at customer services. The member of staff duly scanned the GF items, and lo and behold, they were in the meal deal. I suggested that new labels were needed, with clearer placing on the shelves so that coeliacs and gluten-free dieters could be sure to find them. ‘I suppose so, yes’, she said. I was not hopeful. Nearly two weeks later and no change. I know this isn’t the most pressing issue in the world, but I think it is worth getting fixed. I imagine that many gluten-free people would have a similar reaction to me and perhaps be put off if they too thought that they would have to pay extra for the same meal. The Waitrose up the road does GF sandwiches too…sort it out, Sainsbo’s. Previous PostThe Promised Land: WHOLEFOODS.